The Mahatma Gandhi Institute of Computer Education and Information Technology(MAGICIT), sponsored by the Government of India was officially opened on 17 October 2017 by the honourable General Dr Vijay Kumar Singh(retired)Minister of State for External Affairs-Republic of India. 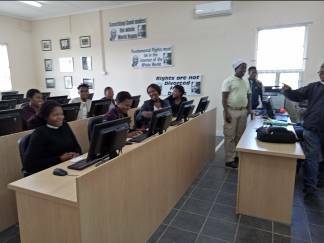 The Centre however was opened to the public from July 2017 and in the 5 months until the end of 2017 591 students were trained in basic computer literacy and some have successfully acquired jobs. This institute is situated on the Phoenix Settlement which was established by Mahatma Gandhi in 1904. It was his first ashram. The building in which it is situated was built in early 20th century by residents of the Settlement as a private school to serve the needs of the children on the Settlement. In the 1930’s the school became redundant as the children were sent to public schools. The building was then converted into the International Printing Press which was moved initially from Durban to Phoenix and housed in a wood and iron building constructed for the purpose, and then moved to this more solid structure. The press closed down in 1962. The Settlement is located in one of the most deprived and poverty stricken areas. The majority of residents are living in temporary shacks while others are housed in very basic government sponsored units. Unemployment rate is high in the area. Many young people are unable to obtain employment even after graduating from University. In this digital age and living in the global village the importance of computer literacy and computer education to the highest level is an asset that can make a difference to this disadvantaged community. So it was indeed a God send to have Mr Roshan Kooblal, a retired educator, volunteer his services to kick start the Institute. The model he used was to train a group of 7 learners who were enrolled on 14 June 2017. The class was facilitated by Mr Kooblal. The first week was used to develop local facilitators and empower them to facilitate the teaching. From this group of learners three local residents volunteered their services. The first local facilitator was Ishwar Nkosinathi Ndlela who facilitated the next two months and also helped develop the other volunteers. The other volunteers from the first group of learners were Mzwakhe Mbatha and Thobani Gumede and they were later joined by Sinethemba Nyawose and Nomusa Xaba. Nkosinathi’s luck struck and he has now obtained employment at the University of Zululand. The plan for 2018 is to offer two more courses viz. Basics of LibreOffice Calc (Excel equivalent) and Basics of LibreOffice Impress (Powerpoint equivalent). So the Institute flies!